Thermage is a safe, non-invasive procedure that's clinically proven to help smooth, tighten and contour skin for an overall younger looking appearance, by stimulating natural renewal of collagen the treatment delivers natural looking results with little to no downtime - on all skin colours, face and body, forehead, eyes, jaw line and jowls, all in a single procedure. Since there is no surgery involved you can generally return to normal activities immediately following the procedure. How Thermage does it work? A handpiece with a smooth, flat tip delivers Thermage's unique radiofrequency (RF) technology, which safely heats the deep, collagen rich layers of your skin. The heat helps tighten existing collagen and stimulate the formation of new collagen over time, which reduces sagging, renews contours, and improves the smoothness and texture of the skin's surface. Thermage treatments average about 45 minutes to 60 minutes per session for the face and up to an hour and a half for other parts of the body, depending on the size, location and condition of the area to be treated. Some immediate results are usually visible and improve over time in the course of your body's natural collagen rebuilding process. 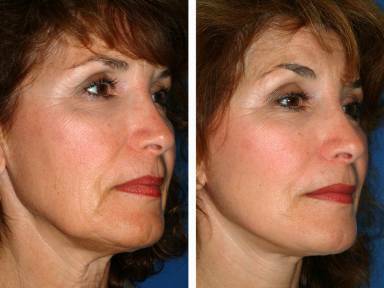 For most patients, measurable tightening and contouring gradually appear in the two to six months following a single treatment session. Results can last years depending on your skin condition and ageing process. Thermage procedures are done at a cost of 50 euro for face, 30 euro for neck, or 70 euro for face and neck. How can I apply for the treatment ?